ROME—If there’s one thing a brother in an Irish family learns quickly, it’s that a conversation with one of his sisters will often lead to some interesting and unexpected situations. 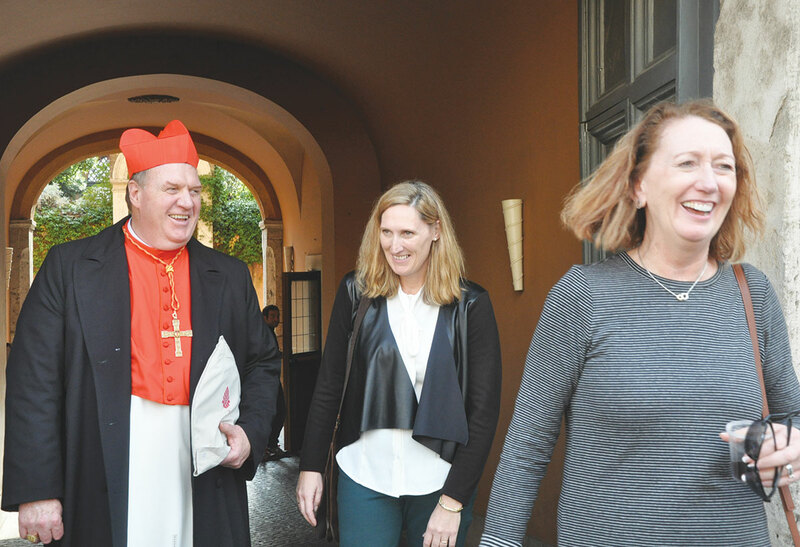 As proof, consider a conversation that Cardinal Joseph W. Tobin had with one of his sisters, Ann Levigne, earlier this fall—before Pope Francis announced on Oct. 9 that he would be one of 17 new cardinals for the Church. The reality for Cardinal Tobin is that his understanding of family extends far beyond his 93-year-old mother, his sisters, his brothers, his nieces, nephews and other relatives—a huge contingent that came to Rome to support him as he was installed as a cardinal by Pope Francis on Nov. 19 in St. Peter’s Basilica at the Vatican. 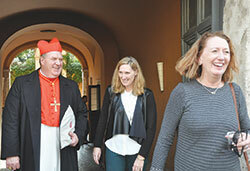 For Cardinal Tobin, his extended family also includes his friends who share with him the charism of the Redemptorist order. And the reality for everyone who has longtime friends is that these friends will often add a touch of humor to their serious thoughts of joy and affection for you. So it is with Redemptorist Father John Steingraeber, who has known Cardinal Tobin since 1966, a time that has included the 12 years that Cardinal Tobin served as superior general of their order founded by St. Alphonsus Liguori. Cardinal Tobin’s “extended family” has also grown to include the Catholics of central and southern Indiana. One of those family members who has come to know him well during his four years as the spiritual leader of the archdiocese is Theresa Brydon, his executive assistant for 2 1/2 years.